In a bowl mix butter, olive oil, lemon zest, lemon juice, garlic cloves, dried sage, smoked paprika, salt, and ground pepper. Mix together set aside. Clean neck, gizzards, and other parts out of the whole chicken. Run over over entire chicken to clean. Pat dry. Rub lemon garlic mixture all over chicken (be sure to put some under the skin as well). Stuff the bird with 1 lemon that has been halved. 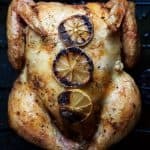 Place 3-4 slices of lemon on top of the bird. Bake for 1 hour 40 minutes, or until internal temperature is 170 degrees.